At the moment, I am enjoying the wonders of Shakespeare’s classic Othello and have heard Iago, the villain, shows Shakespeare’s brilliance. In the opening scene, Iago says how in this world there are two kinds of people: those who work hard for their bosses to just please them and those who pretend to be dedicated to pleasing their masters but really look out for their own well-being to advance themselves. Iago claims those that only work for their masters have no soul and should be punished for being naive. Thus, he says he is of the latter and those are respectable men. Upon reading this dialogue, I immediately recalled the story of the young, ambitious Cuban immigrant in the movie Scarface, Tony Montana. For those of you who have not seen Scarface, it details the story of Tony Montana, a Cuban immigrant who travels to Miami to start a new life. He starts off as a humble dishwasher but is suddenly introduced to the underground crime wave of Miami one night. Immediately after being given orders for his first job, Tony refers to the same idea Iago does and he makes it clear that he is on the same side as Iago. In this criminal empire, Tony “Started From the Bottom” and after completing all of his task the boss was thoroughly impressed by Tony’s dedication. The boss invites Tony to meet him and he is introduced to the wealth of power his boss possesses and what his world seems to offer. Over time, the boss seems to take Tony under his wing and Tony quickly overtakes his boss’ former right hand man, the guy who first gave Tony his orders. Tony then precedes to work for the boss but the entire time he is only looking after himself. Through this opportunity, Tony is learning the ropes of running an empire and is figuring out a way how to make it his. He is motivated by wanting to crush all of those who made him feel inferior and put him down. One day he looks up into the Miami skyline and sees a blimp with the motto: The World is Yours. He then spends the rest of the film struggling with the concept of power while juggling his priorities. The concepts of betrayal, manipulation, jealousy, power, and authority strike powerfully in both Othello and Scarface. Throughout the entire movie, Tony looks out for himself, even while pretending to please his superiors, and is convinced nothing can stop him in his pursuit. He manipulates those around him while seeming innocent and warps his situation to benefit his agenda. Eventually, Tony betrays his boss and takes over the empire and makes it his. In Othello, Iago is the right hand man of the general Othello and he seeks to betray his master by seeking retribution. Iago believes Othello slept with his wife, so Iago creates a scheme to get Othello’s wife, Desdemona, to sleep with his friend Roderigo. Throughout the movie, Tony tries to undermine and question his boss’reputation and leadership by making him look bad. In both stories, Iago and Tony do not think highly of authority as they both indirectly and directly question their authorities. 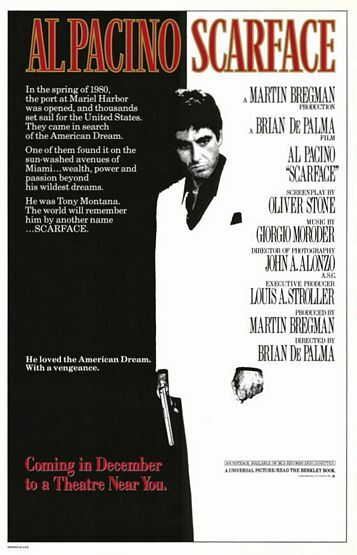 Without giving away the latter half of Scarface, a majority of the film is focused on Tony struggling to balance his obsession with power with the rest of his life. He has to balance his huge empire with family, friends, and other business. Early on, Tony is much more like-able as the audience admires his dedication and ambition to make his life something more than just an immigrant. In addition, both Tony and Iago care about their reputation as people and care about more as time goes on. However, over time darkness takes over and he gets corrupted by the opportunity in front of him. Tony Montana is a perfect example of the anti-hero. This then arises the question, will Iago be corrupted by what he is trying to do and will he fall? It will be interesting to see how Othello will play out.